Examination of programs and projects of oil and gas exploration. Consulting services in the field of preparation of documentation for licensing of subsoil areas and other activities of the Institute. Preparation and publication of scientific papers and monographs. The Institute is publishing scientific electronic journal "Petroleum Geology. Theoretical and Applied Studies". Preparation and conducting of seminars and conferences in the field of the Institute’s operation (including training courses). Training of scientific personnel, including postgraduate school. VNIGRI holds Dissertation Council and organize postgraduate school aimed at training of highly qualified personnel for Economic and five Geological specialties. The Institute of Geological Exploration of Oil (later in the documents - Oil Exploration Institute) was established by the order of the Supreme Economic Council of the USSR of 21st October 1929 No. 92 on the basis of the former Petroleum Department of Geological Committee by. It became the first petroleum institute and was intended to provide the scientific basis for oil and gas prospecting and exploration in the USSR. In 1930 the Institute was referred to the Soyuzneft trust managed by Academician I.M. Gubkin. Establishing of Petroleum Institute - the first specialized institute in the country's economy - enhanced the scientific bases of oil exploration. Since that time, petroleum geology has become a separate scientific field in the country and was gradually supplemented with special methods of related areas: chemistry, physics and biology. Improving the theoretical base of petroleum research is required by the practices of oil exploration, as new and more complex areas are involving into prospecting. At all stages of the development of the oil industry the Institute was initiated new progressive areas of research and methodologies, thereby providing substantial assistance to the industry. Research areas and schools, which form the basement of the domestic petroleum geology, were created and still develop in VNIGRI. Such VNIGRI’s scientists as Porfiriev V.B., Vassoevich N.B., Bogomolov A.I., Avrov V.Ja., Glebovskaya E.A., Veber V.V., Samoylovich S.R., Dvali M.F., Subbotina N.N., Baturin V.P., Krotova V.A., Radchenko O.A., Kalitsky K.P., Prytula Yu.A., Smekhov E.M., Nalivkin V.D., Uspenskiy V.A., Stepanov D.L., Lindtrop N.T., Kudryavtsev B.A., Dobrianskiy A.F., Grossgeim V.A., Bulach M.Kh., Dorofeeva T.V., Sakhibgareev R.S., Khramov A.N. Engalychev E.A., Sverchkov G.P., D’yakov B.F., Alferov B.A., Neruchev S.G., Goldberg I.S., Klubov B.A., Gribkov V.V., Vistelius A.B., Belonin M.D., Khalimov E.M., Sokolov B.S., Mesezhnikov M.S. guide the development of domestic oil and gas science and industry, and allow to substantiate and create the search reserve of oil and gas industry in the country. The period from 1929 to 1940 was characterized by rapid growth of geological surveys covering large territories in new areas. Special petroleum works and theoretical studies apperars in the Institute. Along with this the huge amount of work on the establishing of laboratories in various fields and expanding the geography of research was underway. Thus, while in the Oil section of the Geological Committee in 1928-1929 there worked 52 field crews; in 1930, in the Petroleum Institute, their number reaches 135, and in 1931 - 162, including 88 geological, 16 geophysical and 41 topographical. VNIGRI became the center of Russian oil geological science and scientific personnel for many generations of Russian Petroleum Geologists. Since the beginning of the Great Patriotic War, VNIGRI enters into the most difficult stage of existence from 1941 to 1945. The Soviet oil industry faces new challenges to increase oil production in the central and eastern parts of the country. This required the expansion of the current fund of wells, development of rational methods of prospecting and exploration, improvement of the efficiency of exploration and drilling. Institute undertook significant organizational measures aimed at optimization of some of the directions of its research and production activities. Eleven research groups in oil production and promising areas of the central and eastern regions of the country were created, that focus on the implementation of the urgent tasks. Only a small group of specialists and administrative staff continues to work in Leningrad since the autumn of 1941 until the lifting of the blockade. Possible activities were made directly to the defense of Leningrad, separate tasks carried out on the Leningrad front. 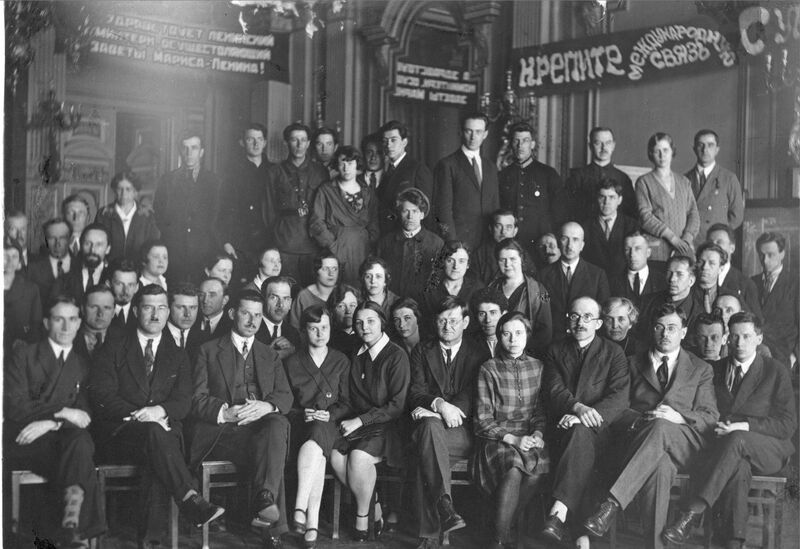 Fifteen employees of the Institute joined the people's militia and fought on the Leningrad front. The post-war period from 1946 to 1960 VNIGRI’s activity is characterized by the expansion of the scope of research, substantiation of new research directions in petroleum studies, as well as strengthening of the scientific and technical basis of the Institute and its financial capacity. Obtaining of the new building (Liteyniy, 39) and premises for laboratories and auxiliary workshops (Vasilevsky Island, Tutchkov lane, 2) represented a positive impact for the Institute. Almost throughout this whole period the Institute, as before, was subordinate to the Ministry of Petroleum Industry, which also created a favorable environment for work. A great job on the establishing of branches and offices in the major perspective oil-producing areas was carried out with the aim to promptly receive factual data and to help local petroleum geologists. Between 1961 and 1984, the Institute devoted his efforts to increase oil production in a rapidly developing industry. Leading specialists of the Institute was actively involved in the study of fundamental problems - practical basis for further developments in the field of petroleum geology. Studies of such problems were carried out in the previous stages of the development of the Institute, hovewer, they have not been considered as fundamental and have not occupied a significant share in the total volume of work. Thus period of VNIGRI’s activity can be characterized as the period of the study of fundamental problems of petroleum geology. A favorable factor contributing to the development of fundamental research, was the fact that the Geological Survey of the oil industry has increased significantly and in many areas could take on the solution of practical problems of petroleum geology. Studies rise to a new scientific level through the development of a rational complex of experimental and modeling work. The Institute is a pioneer in the application and implementation of new research methods in petroleum geology. These include, for example, exploration geophysics and logging, instrumental structural survey, micro-biostratigraphic correlation of wells, study of reservoirs of a complex type, chemical-bitumenological study of fossilized organic matter and modeling of lithogenesis of organic matter, infrared and ultraviolet spectrometry. The method of paleomagnetic stratigraphic correlation of sedimentary strata developed in the Institute and received worldwide recognition. In the period from 1985 to 2009 during the transition to the new system of subsoil use, the appearance of private companies, arrival of foreign investors, new mechanisms of interaction between government and business were launched, a new licensing system for the oil companies introduced that require promptly preparation of scientific studies. In connection with the new challenges the research and analytical activity of the Institute is aimed at monitoring of the status of oil and gas resources and reserves in order to support current and long-term plans for exploration; at the geological and economic substantiation of the conditions of the subsoil licensing; at the quantitative evaluation of referred resources of oil and gas using mathematical methods. The methodology of zonal-local forecast of oil and gas potential and study of the oil and gas accumulation zones; concept of block structure and sequence stratigraphical analysis of petroleum basins; quantitative universal model of hydrocarbon generation, migration and accumulation received further development. Innovative development of new methods and technologies of search and study of hydrocarbon accumulations, etc. Today VNIGRI is a leading research oil institute of the country. Almost all areas of research are headed by highly qualified personnel (PhD in geological-mineralogical, economic sciences). In recent years, the young professionals, representing more than 35% of staff, joined the Institute. Obtaining a huge information base, and preserving the continuity of scientific schools, the Institute conducts research in a wide range of modern theoretical and practical problems of petroleum geology. Recognition of high scientific and practical importance of the work of the Institute is reflected in the awarding Lenin, State and academic awards of the USSR to the scientist of VNIGRI and in the awarding the Order of Red Banner of Labor (1979) to the Institute for its contribution to the creation of the raw material base for the oil and gas industry and the training of scientific personnel. Modern research of VNIGRI’s specialists also received high praise - State Award (2000), Award of the Government of the Russian Federation (1996, 2005 and 2010). Gold fund of the country is a highly qualified specialists. Huge contribution to the preparation of highly qualified specialists belongs to VNIGRI. More than 460 candidate and more than 120 doctoral dissertations have been defended for the all history of the Institute. Many of today's heads of companies and industry are proud to be studied in postgraduate school and defended their dissertations in VNIGRI. «Creation of research cluster in the oil and gas industry to ensure the strategic interests and security of the state in the field of geological study and renewing of oil and gas mineral base on the basis of advanced innovation and information technologies».